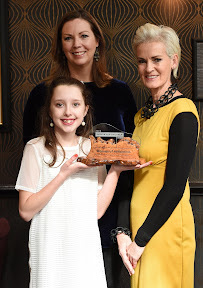 JUDY Murray and a young carer were the stars of the show as they were honoured at Action for Children Scotland’s annual ‘Woman of Influence’ awards. And Judy admitted she was chuffed to bits to win Action For Children Scotland's Women of Influence Awards because she normally picks up the gongs for her sons Andy and Jamie. She laughed: "I'm thrilled to bits because as I was reading out all the nominations I thought I don't remember the last time I won something. I'm absolutely not used to winning anything. I'm quite used to going and picking up something for my kids when they're not in the bloody country after winning things. When you're not ready to make a speech it reminds me of Strictly when I developed a look which Anton Du Beke got very used to and meant I have no idea what's coming next. The prestigious award recognises remarkable Scottish women who have had an outstanding impact on society and are role models to the children, young people, and families the charity supports. To date, the event has raised more than £1.1m to support the charity’s work in Scotland. Judy Murray beat off competition from Caroline Rush CBE, Chief Executive Officer of the British Fashion Council; Amanda McMillan, OBE MD, Glasgow Airport; Dr Catherine Calderwood, Chief Medical Officer, Scottish Government and Alison Di Rollo, Solicitor General for Scotland to win the ‘Woman of Influence’ award. Action for Children Scotland has also honoured Frida Skinner, 11, from Shotts with the ‘Woman of Influence Community Award’. This special award is given to a young woman who has transformed her life as a result of the support received from Action for Children Scotland. Frida is a young carer currently supported by the ‘North Lanarkshire Young Carers’ project based in Motherwell.